The agricultural and biosystems engineering program at Iowa State is traced to 1905 when Jay Davidson organized the Department of Farm Mechanics, creating the first agricultural engineering department in the world. Davidson is recognized internationally as the founder of agricultural engineering. The program he developed at Iowa State set the pattern for programs later adopted by nearly all United States and Canadian institutions offering degrees in agricultural engineering. The Experiment Station received its first patent in 1926 for a device developed by agricultural engineer E.V. Collins to measure the pulling strength of a team of horses. Collins also developed a specially built machine to test the maximum pulling power of a team of horses and analyze what a good farm team could be expected to pull on a daily basis. Wesley Buchele, Iowa State professor emeritus in agricultural engineering, is well known for developing and patenting the first large round baler in 1966 with graduate student Virgil Haverdink. 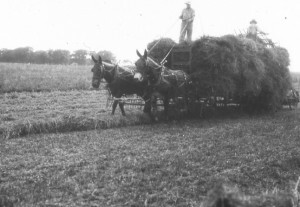 The goals for the baler included wrapping windrowed hay into large round bales, transporting bales, unloading them and distributing them into bunks for animals. Farmers accepted the technology quickly, with more than 18 companies manufacturing large round balers in the late 1970s. The American Society of Agricultural Engineers named a fertilizer application system, designed at Iowa State, top new technology of 2004. Called the Impellicone, the system has the potential to reduce the amount of ammonia used on crops. It received the group’s AE50 Award in 2004, which honors the year’s best products in agriculture, food and biological systems industries. Mark Hanna, extension agricultural engineer, designed the technology. The Impellicone is licensed to CDS-John Blue Co., a manufacturer of agricultural equipment in Huntsville, Ala., that collaborated in its development. Because Impellicone’s accuracy allows for better application control, the technology significantly reduces the possibility to over-apply anhydrous ammonia.